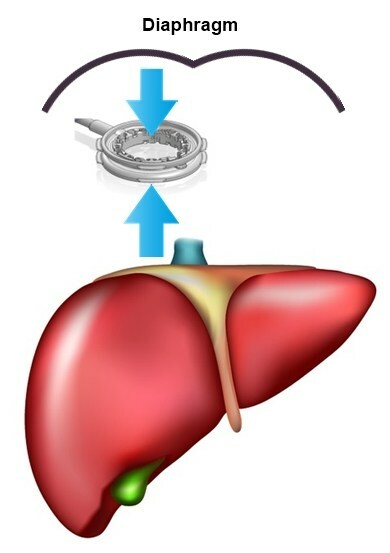 The LiVac Retractor is a single-use soft silicone device which attaches to regulated suction in order to create a vacuum which joins the liver and diaphragm. Unlike most other surgical retractors, LiVac does not require a dedicated surgical incision for insertion and placement. The LiVac Retractor is inserted through a laparoscopic incision or port and placed between either lobe of the patient’s liver and diaphragm. The suction tubing exits the patient’s abdomen alongside a laparoscopic port or through a channel in a SILs port, and is attached to standard suction tubing, connected to regulated wall suction. The tubing is clamped until the retractor is in position, then released. The suction creates a vacuum which joins the liver and diaphragm together, thereby retracting either the right or left lobes of liver. The tubing passes out alongside existing ports, so no extra incisions are required. Suction causes the liver to cohere to the diaphragm thereby allowing access to the organs below, but minimising trauma to the liver. The surgeon’s usual technique for the intended surgery is barely changed. Does not cause compression or congestion of the parenchyma. The LiVac gently lifts the liver from above. As the liver is held up, the plane of dissection readily opens up. © LiVac is a registered trademark of Livac Pty Ltd. All rights reserved.